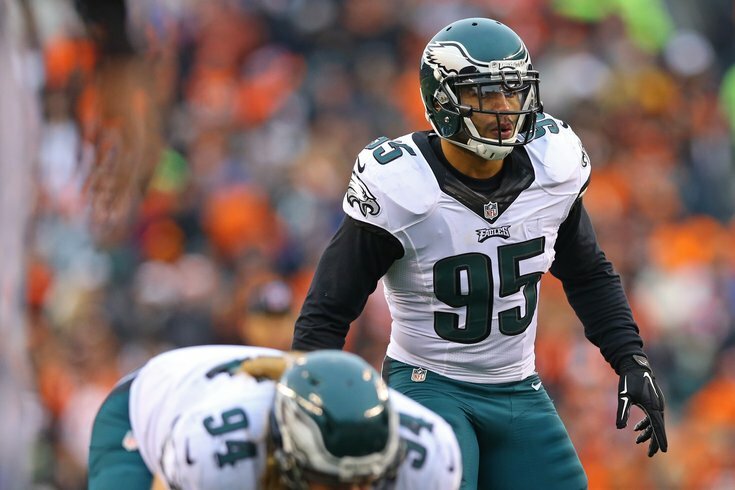 Mychal Kendricks was on the trading block for 47th straight seasons, a new NFL record. In our weekly Eagles chat on Thursday, there were a lot of questions that we could not get to in time or other questions we did answer but could use more color. And so, let's do a mailbag post to answer some of the overflow. Question from Zuri: Thursday morning Ed Bouchette of the Pittsburgh Post-Gazette on NFL XM implied that the Steelers could look into trading for Mychal Kendricks. Could you see that happening? First, I’ll note that I did not hear – and could not find – that interview, but sure, that would make a lot of sense. It's been a long time since the Steelers have been without an impact linebacker in the middle of their defense, but that's where they are with Ryan Shazier's devastating injury. It’s probably their biggest need area at the moment. It was expected that four linebackers were going to be selected in the first round of the 2018 NFL Draft. They were Roquan Smith, Tremaine Edmunds, Leighton Vander Esch, and Rashaan Evans. Surely the Steelers would have been very interested if one of those four players dropped to pick No. 28. The Steelers were probably hopeful momentarily when only one linebacker (Smith) was taken in the first 15 picks, but then, bang-bang-bang, the other three came off the board all within seven picks. I think Kendricks would be a nice fit at ILB in Pittsburgh’s 3-4 defense, and they badly need players there. Would Pittsburgh give up a 2019 fifth round pick? That'd probably get it done. Question from Robb Gaylord: Which position were you most surprised the Eagles didn’t address in the draft (or the position they did address instead)? The only position I knew with near certainly that they would address was tight end, because it was a position of strength in this draft, and it matched up with an Eagles need. The next position in line for me would have been running back, for the same reason. I was surprised they got a DE. I didn’t think it was a very deep DE draft, so I figured those guys would get overdrafted, but the Eagles were actually able to land great value in Josh Sweat in the fourth round. I don’t know how that happened. Question from Hinkie: Who has a chance to be this year’s Patrick Robinson, an unheralded signing who plays a big role? I swear I’m not just saying this because of the revelation of Timmy Jernigan’s recent back surgery, but I’ll go with Haloti Ngata. My perception of the fans’ reaction to that signing was something like, “Meh, he’s old as hell.” While that’s true, I believe he can still play, and he should be a force in the run game in a division where stopping the run is going to be important. Question from Pragmatic: All picks seem great until they play and then you realize why they dropped to the 5th round? Respectfully disagree. All picks don’t seem great. I remember being in disbelief when they drafted a 26-year old guard back in the day. Marcus Smith was immediately pegged as a bad pick. And then there are guys who are thought to be bad picks who turn out to be great players, like Brandon Graham. I do think that in the fifth round, people tend to look more at the prospect’s strong attributes, while first round picks tend to have their flaws magnified. Question from AverageJoe: How good do you expect Sidney Jones to be? I’ve seen as much of him as you have. During the season, we’re not allowed in to watch practices, so OTAs will be my first real glimpse of him, other than that meaningless Week 17 game last year. Jones may be the player I’m most looking forward to watching. I think the Eagles were smart to take it very slowly with him, and I think he has the chance to be really good. But that’s not actually based on what I’ve seen of him in person. Question from Joseph: On a scale of 1-to-Pat Shurmur, how boring was Dallas as a draft venue? First of all, I like your Shurmur scale, and agree that should be the measure of all boring things. I did not go to either draft. Even when it was in Philly, I was either holed up at the NovaCare Complex, or in my living room. As such, I cannot comment first-hand on each venue’s level of awesomeness. However, by all accounts last year, Philly absolutely killed it, while I did not hear a single word of praise for Dallas’ venue the entire draft weekend. It felt a lot like Jerry Jones saw an event he wanted to host, felt entitled to host it, and the NFL enabled him. The proposal they put together could not have been the best plan when the NFL reviewed it and decided Dallas should get it. But whatever.